This was the last Saturday of the month and my felting day. Since only one other person showed up, I was able to felt myself and made the bowl that I have been dreaming of for about a month now. 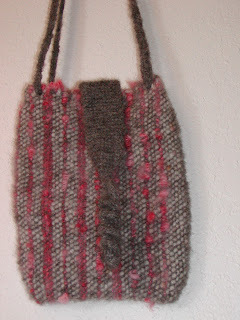 I have been looking at some llama/mohair/wool roving that is in my shop bathroom and wondering how it would felt up. I had already needlefelted a small piece and figured it would work out, so today I pulled it out and started laying it out for felting. The first thing that I discovered, is that it takes a lot more of a blend to felt a sturdy bowl than it would have, if I had stuck to wool only. The second thing that I discovered is that the last layer was too much llama (not the undercoat). I also decided that I much prefer using my own batts. They are already carded and the fiber is blended consistently enough to felt really well. My friend's bowl was perfect and gorgeous. Of course, she stuck with my batts and could not go wrong. She has a lot more Patience than I do. She will probably be selling it on her internet store, etsy. The link is on the home page of my website: www.uniquedesignsbykathy.com. 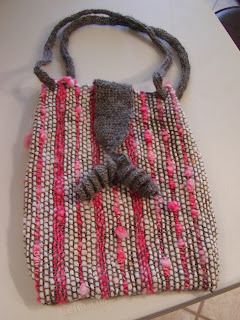 This is the first bag that another friend sewed up from six yards that I wove up in different yarns for bags. 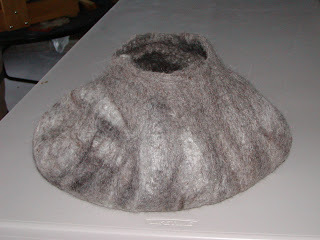 This is how it looked before felting. The one below is the felted version. Funny things happen in the washing machine! The bag shrunk, but the front flap did not. The warp was the exact same fiber as the flap and they did different things. With something inside the bag, the flap will hang like it does in the above photo. The change in color is a result of the weft shrinking and the warp (grey) not. The grey color took over. Since grey is in for the fall and winter, that is not a bad thing. I will be felting again on Monday since someone, who could not come on Saturday, wants to learn to felt. I will make a smaller bowl and see what happens, if I card the same fiber into batts. Certainly it will be quicker to lay out!